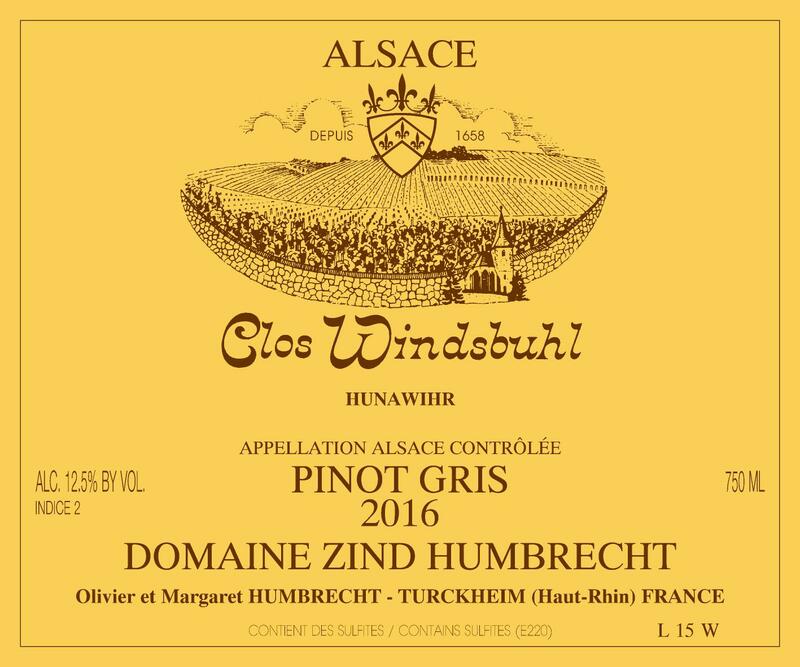 As far as we can go on the history of the Clos Windsbuhl (15th century), Pinot-Gris was the first grape variety precisely ever described as being planted on this late ripening limestone hill back in 1855. Complicated and difficult, like all Pinots, this grape needs a powerful soil able to give structure and character to a relatively fast ripening and neutral grape. On the right site, Pinot-Gris is capable of the best, but the opposite is also true! The magnesium rich soil of the Windsbuhl produces wines with a unique texture and nice vibrancy. Only the oldest vines are used to produce the Windsbuhl wine, and the 2016 was harvested very healthy at an slightly lower alcohol level than usual. The fermentation was mid long (4 months) and finished with a small amount of sweetness. 2/2018: bright yellow colour. The nose shows elegant and discreet nutty/toasty profile. Still very young, it is clearly in need of evolution and time. One can feel that the earth has influenced this wine strongly. The palate comes as surprise as it is much more open than the nose would suggest. Elegant, mid power, with a good presence and not tiring, there is a lively fresh balance and good length. Much more expressive, the mouth brings nice ripe fruit aromas playing with some flinty/mineral type flavours. This is a very easy wine, showing a beautiful potential.